I purchased male and female JR/Hitec style connectors from Major Hobby (1-800-625-6772), but many suppliers carry them. A pack of 4 connectors is about $9.00. These things are actually made by Custom Electronics, and I think you can order directly from them at 1-888-584-6284 M-F 9am to Noon. The package comes with a nice set of instructions, and has pin diagrams of the major manufacture's connectors. After I purchased a bunch of connectors (funny how that works), I noticed that Dymond Model Sport sells connectors at a much lower price ($5.00 for 10) and has the complete servo pigtails also at a low rate ($1.50 each). I haven't purchased from them, and I can't comment on the quality of their materials. Check their web site under "electronic accessories". 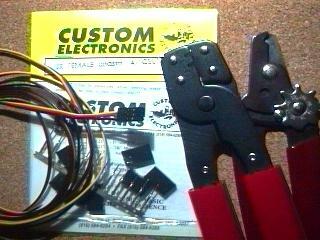 They have several types of servo wire as well, and they have the crimper for the connector pins. After I spent $20 plus shipping mail-order for the crimping tool to make up a batch of Hitec receiver battery connectors, I noticed an absolutely identical tool hanging on the rack at a local Radio Shack electronics store. Part number 276-1595, this "D-sub pin crimper" is complete with two pin bays for 20, 24, or 28 gauge pins, even has the same "TAIWAN" stamped on the side, and can be had for $10. If your local store doesn't have it, they can easily order it, or you can call Radio Shack Unlimited at 1-800-843-7422 and order it yourself. If you bought the connectors from Custom Electronics, you have a fairly decent set of instructions right in the package with the connectors. If not, here is a quick summary (that will probably make a whole lot more sense if you have the connectors and crimper in front of you). You can check the proper arrangement of the servo wires for connectors at Fatlion's site here. Use your keen powers of observation to carefully examine the black plastic connector shells, the silver pins, and the crimping tool. Note that the female pins go into the male shells, and the male pins go in the female shell. Note that the pins have a notch on one side that accepts the locking clip on one side of each hole in the connector shell. Note one end of each pin has two sets of adjacent crimping wings, one for bare wire copper and one for insulated wire. Note that each of the the two crimper jaws is made of two pieces of sheet metal, making the depth of the crimping troughs deeper on the numbers side (for the lesser insulation crimp), and shallower on the other side (for the tighter wire copper crimp). Look carefully at the troughs and see a ridge at the bottom that folds the pin wings back into the wire copper or insulation. Use the 28-24 slot for your regular wimpy servo wire, and the 24-20 slot for beefier battery wire. Look carefully at an assembled servo connector to plan the wire order and the position of each pin notch in your final product. Enough with research . . . time to crimp. Strip the insulation from the end of each wire, just enough to have uninsulated wire in the wire wings, insulation in the insulation wings. If the other end of the wires you are working on end in a battery, try not to be too surprised when the wires spark and the battery gets really hot as you short the wires—been there, done that. I twist the strands of each wire, and I "tin" the copper with a soldering iron and a tiny amount of solder to hold things together and give the pin more to bite, but others don't (the factory certainly does not). Gently pinch the pin wings together slightly so that the pin will fit firmly, wings first, into a trough, with the wings flush on each side of the crimper. Put the pin in the crimper so that the wire comes into the pin from the numbers (insulation) side of the crimper. Think again about where the pin notches need to be for your final product. Hold the wire in place in the pin with one hand, carefully eyeball the process, and crimp with the other hand, crimping both insulation and copper with one squeeze. Once all the pins are on the two or three conductor wires, slide the pins into the connector shell, all at the same time to avoid separating the wire strands far back from the connector, until each shell clip clicks into each of the pin notches. A pin or dental pick can help push in the pins, or release the clip if you goofed. Triple check it, because you can smoke a servo if the wires are swapped. I think the first connector I made looked a little ragged, but I quickly improved. If you are still not satisfied that you've saved enough, you can dispense with the official connectors altogether and make your own from PCB connectors or "board mount interconnect products". You will definitely need to be able to solder reasonably well to use these little guys though, and I’d recommend getting a little soldering “helping hands” gizmo (see the soldering page) to hold the connectors and wires while you expertly solder them together. Part 929834-02-36-ND (male 36 pin connector, $1.39) and part #929974-01-36-ND (female 36 pin connector, $2.04) from Digikey (1-800-344-4539). These are made by 3M and have the same pin spacing as standard servo connectors, and you can cut them up to make 12 connectors of three pins each for a considerable savings. 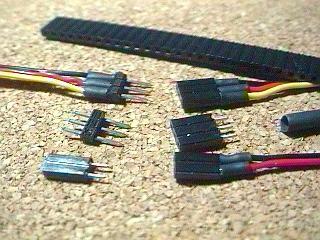 Before you get huffy about using only real connectors, take a look at your receiver--those pins soldered to the circuit board in your receiver are the same sort of thing as these connectors. I found that a razor saw, particularly with a little miter box, makes quick work of cutting the 36 pin connectors into two or three pin connectors. Note that the female connector is the one that plugs into your receiver, since these connectors do not have an external shell. You can pull the pins out of the connector shells with a little effort, but the pins then will not lock back in as with the crimp connectors above. With a soldering iron and some 1/8" or 1/16” shrink tubing, you will be set. Digikey part SFTW2018K-5-ND is 1/8" and SFTW2116K-5-ND is 1/16" black very flexible polyolefin heat shrink tubing, $2.48 for five feet. Servo wire can be purchased from most servo suppliers, and costs about $12.00 for 50 feet. All up servo pigtail with 5" wire ($0.10), connector ($0.17), and 3/4" shrink tubing ($0.03) is about $0.24 each, not counting solder and your time. 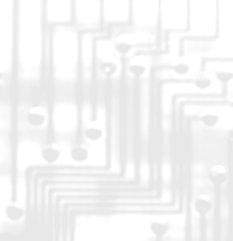 Return to Electronic Projects page.